When facts get blurry, returning to history can be useful. The colonialization of Palestine and its occupation by “Israeli” forces is not a saga based on which Palestinian grandparents make up stories to tell the new generations. In fact, these grandparents were exiled from their homeland, Palestine, where the “Israeli” apartheid entity was established and its immigrants came to become the settlers of these occupied lands. After more than 69 years to the plight of the Palestinians, and the day when the “Israelis” attacked Palestinians and committed the infamous Deir Yassin Massacre, US president Donald Trump announces his decision of moving the US embassy to Occupied Al-Quds [Jerusalem] and simply declares that Al-Quds to be the capital of the occupying apartheid regime. At least since the 1967 war, the United States has been “Israel’s” strongest advocate. 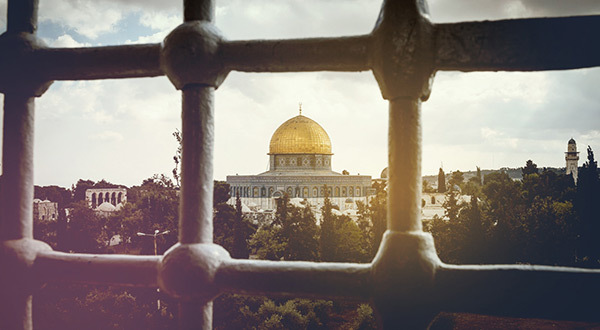 Al-Quds, the capital of Palestine, is an Arab and Muslim small country in the Asian continent that has a very sensitive strategic location owing to its history, geography, and the fact that it is the cradle of different civilizations and religions. For Muslims, Al-Quds was the first qibla, before the Kaaba in Mecca. This spot was the place from which Islam’s Prophet Muhammad proceeded on his journey, described as the ascension to heaven in Islamic literature. It is also the place in which Jesus called for Christianity, shared the Last Supper with his disciples. Historically speaking, Al-Quds has generally been the site for Muslim pilgrimage, prayer, study or residence. Al-Aqsa Mosque was a particular seat of learning. This city, where people from the different faiths lived together, became witness to the worst crimes committed by the “Israeli” apartheid entity which was established in 1948 by virtue of the Balfour agreement, which was set up by Britain in the course of World War I. The roots of the idea of establishing an “Israeli” apartheid entity goes back to decades earlier. In 1896, Theodor Herzl, a Jewish journalist living in Austria-Hungary, published the foundational text of political Zionism, Der Judenstaat [“The Jews’ State” or “The State of the Jews”], in which he asserted that the only solution to the “Jewish Question” in Europe was the establishment of a state for the Jews. It is worth mentioning that in 1916, when Palestine was still under the rule of the Ottoman Empire, the Jews back then were not Zionists, and they constituted 3 per cent of the population who lived side by side with people of other faiths. It is worth noting here that the people of Palestine differentiate between Judaism and Zionism. The latter is not a faith, but rather a political phenomenon with expansionist, racist and colonialist aims that under the cover of the Jewish religion takes on a religious appearance and tries to pursue its goals as the savior of the Jewish people. Muslims represented the majority of the population back then, followed by the Christians. If we are to overview the entire history of the region, the story becomes endless. But the guidelines provided above present a few of the links that make up a full chain; the bigger picture. In 1979, a dramatic change took place in the Asian continent. A popular movement led by Imam Ruhollah Khomeini was initiated in Iran and an Islamic Republic was established. Iran no longer was a client to the United States of America. The Asian country also no longer supported what it declared to be an occupation, and an apartheid regime. For three decades before the Islamic revolution, between “Israel’s” illegal establishment in 1948 and Iran’s revolution in 1979, the two countries had close relations based on common strategic interests. Iran became an important source of oil for “Israel”, and “Israel” became an important source of weapons for Iran. It has been reported that thousands of “Israeli” businessmen and technical experts aided Iranian development projects. Even before the revolution, Ayatollah Imam Khomeini paid a great deal of attention to al-Quds, the holy Aqsa mosque, and the Palestinian cause. “My proposal for establishing an Islamic government does not mean a return to the past. I am strongly for civilization and progress”, said Ayatollah Imam Khomeini in January 1979. By that, he meant that Iran does not have to be under the impact and rule of the communist thought at that time represented by the Soviet Union, nor by the capitalist ideology that was raised as the only method of success by the US. Yes, rejecting both the influence of capitalism and communism, Iran decided to become independent and different. For Imam Khomeini, “Neither East Nor West” was a proposal that proves the freedom from subjugation and guarantees success in creating an independent strong identity and defending rights. For Ayatollah Imam Khomeini, who descended from the Islamic Shia school of thought, the oppressed and the oppressors was a notion that was the focus of his attention. It was a must to support the oppressed, and not only in defend Islamic sanctities. It was the spirit of the revolution that rose from the people with Ayatollah Imam Khomeini’s leadership to support the oppressed across the world in order to realize a just cause. But of course, Palestine was of vital importance owing to its Islamic identity. Deciding to establish an “Iran” with an independent Islamic identity, Iran’s Ayatollah Imam Khomeini stressed throughout his discourses that Palestine is a central cause to the Muslims. Ayatollah Imam Khomeini always considered that returning to Islam and uniting is a prerequisite to save Palestine and block Zionism’s expansionist plans. Islamic differences were never an issue for Ayatollah Imam Khomeini, in fact he always called on Muslims to put their differences aside and seek unity. While addressing the people, he pointed out to the different dimensions of the war on Palestine and the Muslims, and explaining at the time the notion of the “colonialization of the mind” and how it is used to manipulate the people of the region as means to weaken them. After the passing away of Ayatollah Imam Khomeini, the pro-Palestinian discourse did not stop. It is true that the two countries do not share the same borders, and they come from different Islamic schools of thought, and they speak two different languages, but Ayatollah Imam Khomeini had demonstrated that nothing can impede Iran from standing by Palestine and the Palestinians. It is Islamic values and ethics that form the driving force behind the Iranian support, and true values do not die in general. In fact, the speeches of His Eminence Imam Sayyed Ali Khamenei, leader of the Islamic Revolution, are a continuation to that same identity that supports the Palestinian cause. From the Islamic Republic’s point of view, it is and has always been a confrontation against oppression and distortion. Just like Ayatollah Imam Khomeini, Ayatollah Khamenei time and again reassures that Iran’s position on the issue of Palestine is crystal clear. The “Israeli” soldiers have carried out all sorts of crimes against the Palestinians; from killing the people, destroying their homes and farms and arresting and torturing men and women and even their children, to humiliating and insulting that nation and trying to destroy it, to building illegal settlements and attacking the Palestinian refugees in the camps inside Palestine. Today, Iran stands strong in face of the US decision, and voices support to the Palestinians as well as urges the international community to act. Iran does not stand alone but is supported by regional players both state and non-state actors. For instance, as Lebanon’s Hezbollah Secretary General Sayyed Hassan Nasrallah clearly stated that the resistance stands with utmost readiness to defend al-Aqsa mosque and support the Palestinian brethren, Turkey’s Erdogan pointed out that al-Quds is a “red line” for Muslims who will not accept any aggression on its Islamic sanctuaries, and said that what “Israel” is doing against Palestinians wolf does not do against the sheep. Today, Iran reiterates “neither East, nor West” but an independent Palestinian Palestine that has the right to preserve its people, land and sanctities. No East Al-Quds and no West, but a one Palestinian al-Quds acknowledged as the capital of Palestine and its native people.